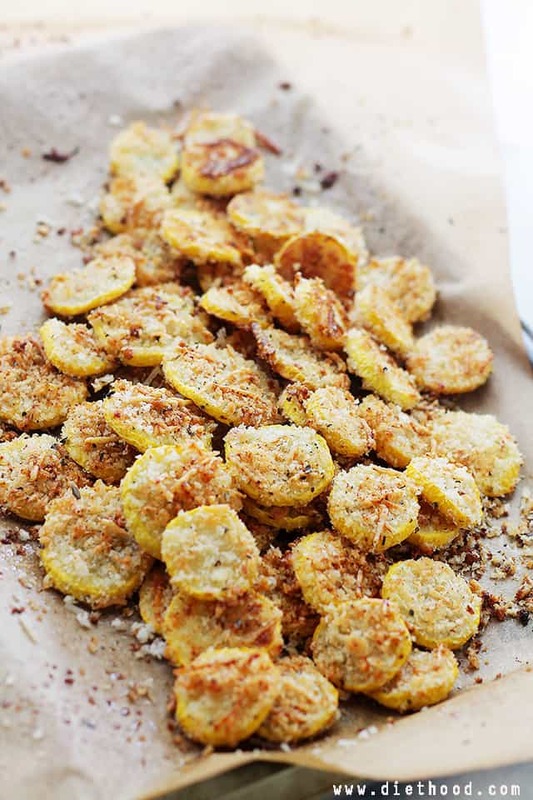 Garlic Parmesan Yellow Squash Chips – An incredibly flavorful, crispy, and absolutely delicious snack! In my head, that’s a really loud, filled with a lot of excitement-kind of “HI”. Hopefully, you can “hear” me. The other day a friend of mine posted a study on her Facebook page stating that cashews are just like Prozac. After reading that, it all started to make sense. I AM the way that I AM because of all the cashews I eat, daily! My happy-go-lucky attitude and mood is controlled by cashews!! Ummmm… so what does that mean for you?! Nothin’. You just get to read my exclamation points and know that the excited shouting is fo’ real. 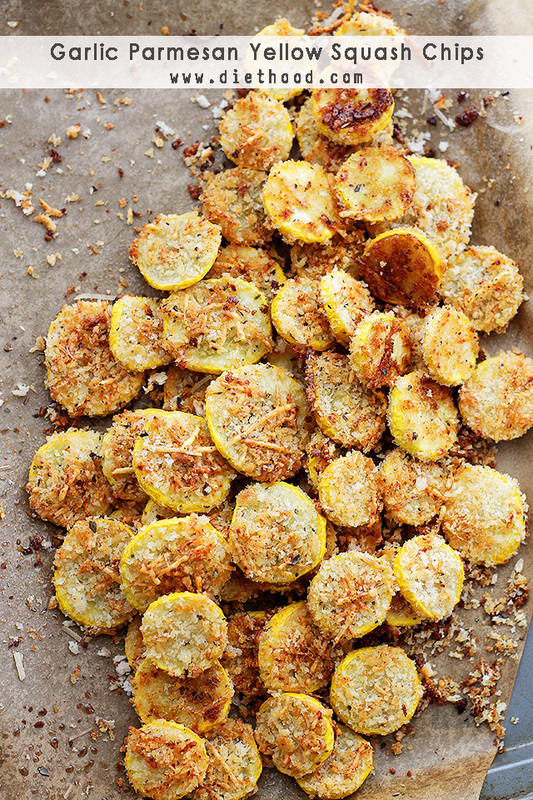 Garlic Parmesan Yellow Squash Chips are also, fo’ real. Yellow Squash is the new Zucchini. Truth be told, if my nose was plugged and my eyes were closed, I wouldn’t know the difference. All squash is quite the same to me, but what you put in it, on it, or inside of it, is what matters. Really, though, they’re just a vessel for all things cheese. For the last month or so, not only have we been living on squash and tomatoes, but along with that we’ve OD’ed on Zucchini Fritters, Zucchini Chips, and Squash Crisps. Chips. Err, Rounds?? Whatev. Obviously, vegetables and I are like *THIS*! With a side of brownies, of course. As long as we’re being open… I’m desperately in love with these Garlic Parmesan Yellow Squash Chips. Whenever I make this recipe, I eat half of the batch before I get a chance to serve it. It’s so easy to just pull out the baking sheet from the oven, and while I’m prepping the rest of the uncooked chips, I just eat all the ones that are already baked. I cannot even begin to describe the indulgence that happens when I finally DO serve them. People be like, gimme more gimme more!! And I’m all like, I can’t, I ate ’em all! Thus, these Chips, Crisps, Rounds, Fritters?? I dunno what they call ’em these days, but I don’t even care if they have a name, to be honest. These are BEYOND amazing! AND, there’s no batter to dip ’em in. There’s no eggs, no milk, no nada. Just some olive oil, seasonings, panko crumbs and grated parmesan. OH! They’re also baked!! EEK! An incredibly flavorful, crispy, and absolutely delicious snack! In a large mixing bowl, combine squash, olive oil, salt and pepper; mix until well combined. Dip slices of squash in cheese mixture and coat on both sides, pressing on the coating to stick. Remove from oven; gently flip over all the slices, lightly spray with cooking oil and bake for 8 more minutes, or until chips are golden brown. Remove from oven; transfer to a serving plate and serve with a dollop of Non-Fat Plain Yogurt. fresh grated parmesan or out of the can? You can buy these at Sam’s for 7 or 8 $ per bag! They’re delicious! I dipped mine in an egg wash to get the breading mix to stick better. It was amazing. I didn’t have panco so I used Italian bread crumbs. Not bad, very tastey. Next time I will cut them thinner for more crispness. Someone used wire racks instead of flipping individually. I’ll be trying next time too. Great idea and Keto compliant for me too!!! Maybe use almond flower instead of the panko bread crumbs. Panko isn’t Keto friendly. Porkrinds!!! They are 0 carbs & add a good crisp !! You CAN get gluten-free Panko crumbs! I found some in trying to prepare meals for a neighbor who is gluten and dairy intolerant! Has anyone tried this recipe in an air fryer rather than the oven? I imagine they would move about a bit since they are so light. Thanks for this recipe, Katerina!! However, I would suggest your readers use AVOCADO oil instead of OLIVE oil because AVO oil has a higher smoke point. Olive oil, cooked on veggies at this temp, is losing it’s antioxidants and also developing free radicals on the oil and the veggies as well, creating carcinogens that people are consuming. (Carcinogens can lead to cancer). Also, if you’re gluten free, like I am, just ditch the bread crumbs. I’ve been making these without bread crumbs for decades and they are super delicious. Not using breadcrumbs can also reduce the “addictiveness” of eating them, which can help with portion control and weight management. Just a thought. Anita Davis, I so agree with you and there is an avocado oil spray made by Pompeian. I love it and use it on just about everything!! Great way to destroy a great recipe! These were great! Followed your recipe to a T. Thanks!! Wow!!! Unbelievable! These were fantastic – had to fight my 7yo for them he would have eaten the entire batch had i turned my back. One question, however – what is the purpose / benefit of the parchment paper? Keeps them from sticking to the pan and makes for easy cleanup. It might also help them crisp up. I’ve made these twice already. I use both freshly shredded Parmesan and Romano cheese and half the olive oil. Mmmm mmmm! Sinful perfection! Thank you so much!!! These were amazing and simple. I LOVED the crunchiness. 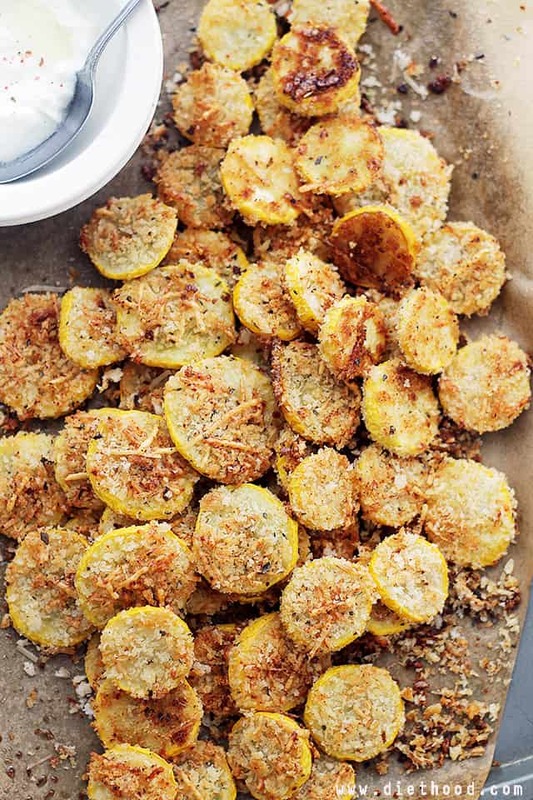 Since my daughter and I are the only ones who eat veggies, I cut everything down (1 squash, 1/4 cup crumbs, etc.) I don’t mind making them and prefer having freshly made ones. I’m going to try it with zucchini later this week. Thanks! I did the same, just 1 squash, and cut down on everything else, of course. The result tastes heavenly, but they’re not crispy. Maybe a bit more oil? The thinner slices were tough to flip, but whatever… they’re squash, and they taste good! Who’d ‘ve thought? Thank you for sharing the recipe! I put mine on a cooling rack to bake. I still flipped them, but I just gently played another cooling rack on top of the one with chips on it and flipped it. Faster and easier than flipping one at a time. Awesome idea!! Will try that the next time I make them!! When I was growing up, my mom would make the fried zucchini version of these. I definitely have to try this healthier approach! How do they store, say if you were making to put in lunch for the week. I was wondering the same thing? Did anyone ever respond to this question? Delicious! I may never try again! HI! The nutritional facts are there now. They were there before, too, but because of a glitch, they were hiding behind a code. 🙂 Thank you! I didn’t read this entire blog but rather skipped right to the recipe. Since I am on a low carb diet I have been changing the use of bread crumbs in recipes to ground cashews (which I did for this one too). Then I sent my mom the link to this blog. She told me to read the entire blog so I could see the connection between my alteration of the recipe and Katerinas love for cashews. Try it Katerina, it’s amazing!!! Just an idea, but, you could use finely ground pork rinds. Hi! If you don’t mind, could you tell me what was so hard to read? I’d like to fix it if something doesn’t look right. Please let me know. I believe that a darker font color for the blog (like black rather than light blue) would be easier to read. Use the same color that is used for the formatted recipe itself. Also the font size used on the blog may be too small for some. Of course, people can always zoom the page if the font size is too small. The comments are really hard to read. the font is sooo light. Recipe sounds delish. Found these on pintrest. Made the recipe halved along side some pretzel grilled chicken burgers. Great side dish! Thanks 🙂 . I don’t have a mandolin so it was a tiny bit time consuming making really thin cuts – but wow they crisped up nice. My husband said they were okay but he’d eat them again. My oldest said that they were good. I didn’t have grated parm so I used a shredded romano parm blend. I did have to push the topping on which is okay. It was kinda clumpy in some spots but when it browned and crisped the cheese melted and adhered to the veg. Also used whole wheat panko bread crumbs for more nutrition. Just made these!!!!! So delicious! Thanks so much for sharing recipe! Just made these, yep, they’re pretty addicting, cut them thin so they crisp up. Hi! I don’t have any panko crumbs so I will be trying this with regular bread crumbs. I’m cooking these right now! But I was wondering if I made a big batch how you store them? Fridge or a bag on the counter? I was hoping to make some for an upcoming long car trip. Much better than the junk we usually wind up eating. Hi Becca! MY apologies for the delayed response; I was away all weekend and couldn’t get to my computer. I’m not sure how these would hold up if made in advance. Storing them in the fridge would result in soggy chips, but they might hold up well if they’re in a bag for a few hours so long as you place them in the bag when they are completely cooled. If you could, let me know how it turned out! Have a great Sunday! No, you don’t peel the squash – it’s the small yellow squash, it doesn’t need to be peeled. Would they stay crispy if stored in a brown paper bag? Plan your Golden Globes party here! My boyfriend and I made these for Thanksgiving and the whole family loved them so much, they insisted we make them again for Christmas! We did zucchini as well as the yellow squash to add some more color. One thing, we did have some trouble getting the coating to stick to the veggies, it kind of fell off in big clumps. Any suggestions? It doesn’t affect the taste at all so not a big deal! Lightly spraying them with cooking spray burnt them and just about caused a fire. Never going to do that again. Would have been much easier and safer to broil them for a minute or two. I’m sorry you didn’t enjoy the chips. 🙁 But, if I may ask, how did the cooking spray almost cause a fire? I hope it wasn’t a misunderstanding of the recipe. You are to spray them lightly with cooking spray before placing them in the oven. The cooking spray helps with adding a bit of crunch. Not sure if you can tell by the pictures, but I try to pick a squash (whether it’s yellow or zucchini) that is slim when I want to make chips… smaller slices crisp up much better than the wider ones. If I were you, I wouldn’t give up on them. 😀 These are really, really good… it’s a delicious appetizer that I often make for friends. Yes and yes! I’ve got to make these asap! I want to dive into the pile of these and only surface when I need air. 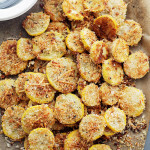 I’m a sucker for squash and parm! Squirrel and I have been consuming zucchini and squash chips at least once a week. We even made eggplant chips the other day. I totally get your excitement, because this recipe is something to get excited about. And, it’s way easier than (and healthier) than frying. Kate, you had me at parmesan, but the fact it’s crispy AND a veg? I’m in. Nice work! I’m a chipaholic-I can inhale an entire bag but must refrain myself because of calories, these might just do the trick-yay for healthy chips! Oh my my I love yellow squash and I’m loving these chips. I mean, it’s chips. What’s not to love? What a fabulous idea! There is so much squash going though my kitchen right now!! Yum! I’ve been attempting to branch out with my veggies besides the usual steaming and this looks easy and a family winner. I love zucchini and squash and you’re totally right…I cannot tell them apart. Love them both, especially when coated with breadcrumbs and parm 🙂 Pinning this to make it pronto! 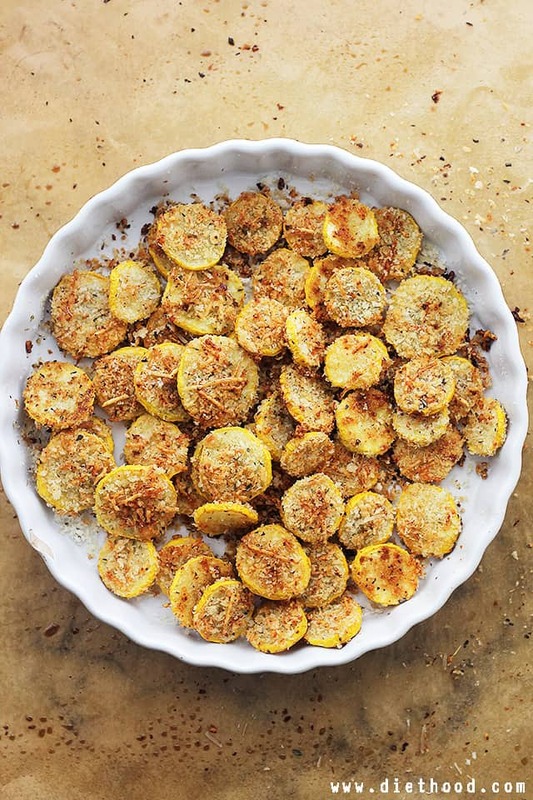 I’m not a fan of squash or zucchini but this dish is lovely. Yellow squash is definitely the new zucchini. And chips covered in cheese are kind of the best yellow squash recipe ever! I eat zucchini and parm like it’s going out of styyyleee. But in a yellow-squashy, chip form? NEED TO TRY. These look awesome! Pinned!